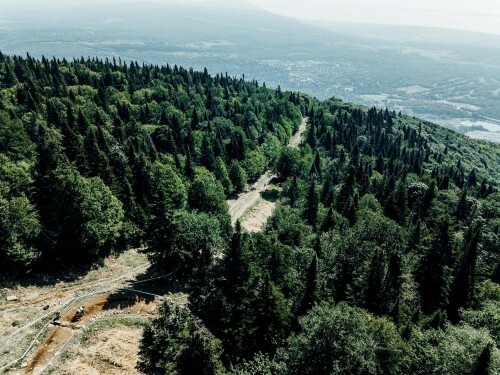 Next week will be the 21st visit for a UCI World Cup or Champs to the hallowed hills of Mont Sainte Anne just outside Beaupré, Quebec. A yearly pilgrimage that somehow doesn’t seem to to bore even the most seasoned of veteran. Possibly due to the high speeds, the easily shreddable rideable terrain regardless of a weather and the maybe more than anything else the family holiday vibe that grows as the days pass, due in no small part to the MTB community renting every chalet, house and condo along the short MSA strip! The mountains of Quebec like those south of the border in North Eastern USA are big, but not the imposing “boom” straight up walls of rock that often great riders and racers in the European Alps. Instead MSA gives us big, shallow and long. Three potentially key ingredients that keep the race puzzle here fresh for so many, less braking more ploughing? This lack of steepness doesn’t lead to a lack of intensity though, from the first heavy pedal stroke out of the start house, down the now iconic rolling start-ramp things get fast, quickly and just keep building in momentum from there. 2017 gave us yet another round with a mixed bag of weather. The 4.00 p.m. rain party rolling in on queue again. Un-phased Aaron Gwin displayed all the calm, calculated characteristics that have led to him to wrapping up 5 overall titles to date. Riding under the rain, straighter and faster than anyone else. Bagging in the process the full quota of points on offer in the overall title battle that day. Coming into qualifying Gwin trailed Minnaar by 253 points – 3 more than you can earn in one week’s racing. Leaving MSA the deficit between the two titans was so reduced that it left the final round in Val di Sole as an all or nothing battle. What we all learned in the process though, was that anything can and will happen and as long as you come prepared and willing, victory on race day is possible. The 2017 ladies race in MSA was contested under fair and consistent conditions. Although on a more damp, blown out track that was considerably harder to push your limits on than then was ridden in qualifying. Qualis saw Myriam Nicole eek out a 1.491 sec margin on Tracey Hannah. When Race day rolled in though things changed. In now expected fashion Tahnée Seagrave flipped a 4+ second quali deficit into a race winning display of calculated on edge riding. 5.7 seconds faster than second place Nicole. Rumbling in to MSA this coming week for the 2018 race the only constant is change. Maybe that’s a large part of the reason everyone is so stoked to go racing? In no particular order, on the men’s side, we have the return of Moir and Minnaar from injury, the latter has been rehabbing in style, in the most specific way possible slapping bumps on Morzine’s infamous Le Pléney. 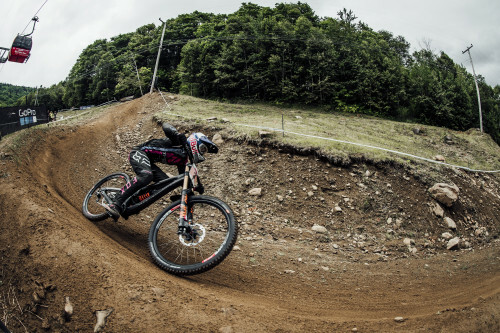 The former has already practiced at Andorra World Cup and hopefully is ready for racing. With the return of some, the biggest notable absence for MSA is 2017 winner Gwin, at least that’s the info available to hand at the moment. Race day will tell more! Pierron (Amaury) has a healthy lead in the overall, but as 2017 thought us with 2 races left anything can happen. On fire at French Champs in Morzine, Pierron is the man to beat, even though his compatriot Vergier had one of the most stunning race runs in recent times on route to his maiden WC victory in Andorra. 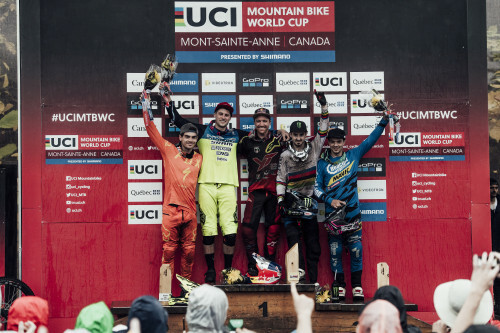 Luca Shaw will be as hungry as ever although a hungry not quite as grumbling as Loic Bruni’s, 2018 podium first timers Reece Wilson & Thomas Estaque will go good on the long, fast bumps of the Mont. 2017’s FTD title at MSA went to Finn Iles on a dry track, after his first elite podium in Vallnord he’ll be keen to climb a few steps higher at home. Other’s to watch closely are Harrison, MacDonald, Greenland, Pierron (Baptiste), Walker, Mulally and the Eagle Masters. 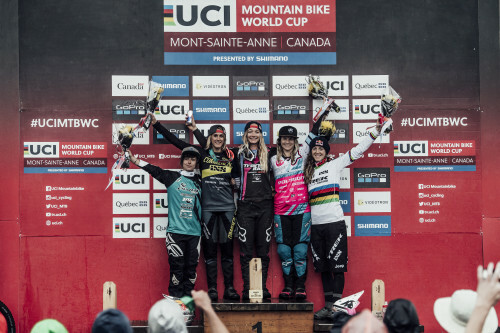 The ladies race gives us one the most interesting title battles in years – even after a DSQ in Leogang, Tahnée is just 80 points behind a resurgent Rachel Atherton. After missing two races Myriam is back, a much needed world class rider in the field. Three ladies with the pace and killer instinct needed to win but with three totally different approaches to doing so, watching how the week unfolds as we build to race day will be most interesting. The eagle eyed analyst may have seen how the split times and sector demands of the shorter and longer tracks have played out for the women this year. With a pattern emerging. MSA’s length and high speed impacts may favour the brave, but the brave and conditioned even more. At least one new section, dubbed “Tarzan” otherwise pretty unchanged from the past 2-3 years – no matter what, racing will be fast, straight, high speed whether in or out of the woods. We would say bikes take a hammering but those days are beyond us now. What “approach” does it take to win at MSA? Well I don’t think I’ve personally attended enough races at MSA to know the finer details just yet, but from the experience I have at the venue it’s directness and confidence on the less confidence inspiring sections that counts. Race strategy is built by race tactics…tactics for practice, for each run, for sections, for sectors and finally for the race run it self. Braking just at the right time, some call it late braking, is crucial; as carrying the huge speed generated as free momentum into the subsequent sections here is paramount. No point in not using those speeds built on the flat out piste to keep your wagon wheels ploughing over rocks and boulders as you transition from open to wooded sections. Subtle but convincing changes of direction on the loose, fast piste sections, total conviction and commitment to line choice in the slab infested woods, wet or dry, braking just “late” enough, soft transitions from edge to edge of you tyres and no let up in the “fitness” abilities needed to take the hits, deal with the impacts and hold and coax the bike from line to line, rock to boulder! So maybe that’s the formula, total subtle committed conviction! ?